Whether your students want to be a shopper or a grocer, they will love playing with the items in the Smart Market. Each of the pieces resemble real items in the grocery store to expand their imagination as they work on their reading, writing, math skills and more. Visual and tactile learning style is perfect developing number-recognition skills, counting skills, comparison skills and more. 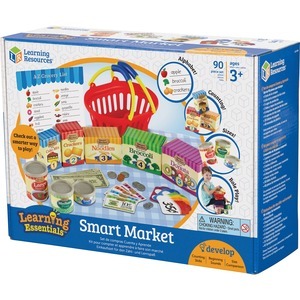 Smart Market is designed for children ages 3 and up.